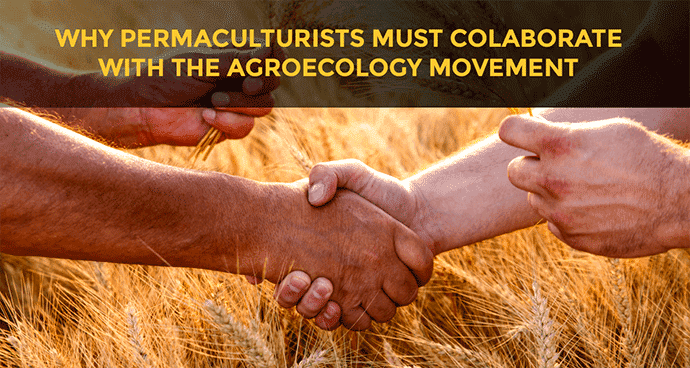 Description: Permaculturists must continue to look outside the boundaries of their discipline to evaluate the resources and opportunities presented by other branches of knowledge and movements in supporting the agroecological transition project. What permaculture can learn by agroecology? Permaculture offers distinctive resources for the agroecological transition project. With systematic site design, integrated water management, emphasizing diversity at multiple scales, and access to global germplasm, we can enhance the productivity demonstrated by heritage agroecosystems especially labor productivity while retaining their most desirable attributes of sustainability and multifunctionality. The permaculture movement shares a distinctive worldview to current and potential concepts and disseminates elements of practice and designs through networks of practitioners and small institutes. The function of such popular movements and networks in improving agroecological transition through the mobilization of both political and social support is increasingly acknowledged in the peer-reviewed literature. The growth and dissemination of permaculture is built on two basic patterns: A wide dispersed network of “itinerant teachers” and international and local/regional organizing base around “bioregional” cultures and the development of alternative economic and social institutions. The bioregional organizing aspect of permaculture popularizes ideas associated with alternative institutions and realized projects include gardening organizations, farms, demonstration sites, multi-issue community organizations, campus greening and local food initiatives and a diversity of accredited and unaccredited institutions of higher learning. The concept network analysis reflects the importance of concepts of community and society in the permaculture literature. The abstractions, “community” and “development” are present and closely related in all these sequential analyses, becoming more central over time. The focus on traveling teachers has distinctively marked permaculture’s development with high-profile professionals (permaculture celebrities) whose international travel is organized around solicitations to teach courses and by employment opportunities as designers and consultants. The focus on traveling teachers played a major role in the rapid expansion of the movement. Permaculture is the groundwork of concepts and Ideologies but where Agroecology can lend a hand in the application and organizing the movement to one institution process. The permaculture movement shows significantly less organization and institutionalization than other international agroecological movements. This lack makes the coordination of beyond the immediate community scale difficult or impossible and thus limit the potential for mobilization of political support for diversified farmers. The distribution of permaculture publications has changed from sharply demarcated to relatively diverse. The initial geographic restriction can be traced to the English language origin of the permaculture framework in Australia. The geographic relationships between the place where publication is done and place of topic, however, show a low level of diversity that parallels the “coloniality of knowledge” described in the agroecological literature, wherein writings in both the developed and the under-developed world are published in advanced countries, and few studies of advanced countries are published in the third-world countries. What agroecology can learn by permaculture? The relevance of permaculture to agroecological transition is partly driven by the worldview disseminated by the permaculture movement. The strong following that people in the Permaculture movement believe in and relate to reflects the Dissemination of the culture that is missing from Agroecology. The emerging focus on the agro-ecological literature on the “worldview challenge” acknowledges the importance of knowledge and beliefs for the transition. Any agricultural system is not a set of practices but also a basic conceptual framework of knowledge about how and when to apply a particular technique, a belief system that proposes a mechanism of action and a normative proportion about what practices and land use goals are desirable and why. Agroecological transition needs not only new techniques but new stories to provide context and meaning for those techniques. The permaculture literature expresses a reflection of human-environment relations that highlight the positive role of the human in the landscape, as ecosystem managers. The perspective on human-environment relation cuts against the grain of the dualistic worldviews of both growth-oriented development and presentation-oriented conservation, each of which describe a fundamental conflict between the needs of the society and those of nature. At the center of the permaculture worldview is the notion that with the application of ecologically informed holistic planning and design, human can meet their needs while increasing ecosystem health. I think it should go without saying that the linkage is a natural one. There is too much exclusive claiming of some false ‘higher order’ of one disciple or movement or another. Inclusion is what is needed, since the exploitive eternal economic resource-based exploitive growth model needs assigning to the dustbin of history. We can surely do so much better, pooling all our combined experiences and capacities.